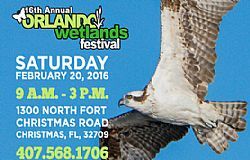 ORLANDO – Come and enjoy the Orlando Wetlands Festival on Saturday, February 20, 2016, from 9 a.m.–3 p.m. at Fort Christmas Historical Park. The Orlando Wetlands Festival is an opportunity to celebrate the Orlando Wetlands Park, the City-s 1,650-acre wetland oasis. Admission and parking are free, but registration is requested. Experience this unique wetland treatment system with the entire family! Orange Audubon Society will lead guided bird-watching excursions, the Florida Native Plant Society will lead native plant identification hikes, and the Florida Trail Association will be providing wilderness hikes. Or bring your camera and join a guided photo hike led by professional photographers. There will be many interactive children's activities (like Out-On-A-Limb kids' tree climbing), bounce houses and much more! So bring the whole family and invite your friends and neighbors to this fun, free educational festival. For those who like to sit and ride, guided bus tours will travel along the wetland berms, giving riders a chance to experience firsthand Florida's wild wetlands. Hay rides will also give riders a chance to relax and take in the scenery. In addition to the numerous guided tours, there will be bird-banding and mist-netting demonstrations, as well as, live music by Homer Stiles. Featured in the various wildlife shows, many different live animals will be present such as alligators, snakes, birds and many others. The City's Families, Parks and Recreation Department will be giving away free backyard trees in celebration of Arbor Day. To get to the Park, take S.R. 50 to Christmas, Florida. Turn north onto 420, Ft. Christmas Rd. Continue north 1.8 miles. Fort Christmas Park will be on your left. Free parking will be located on your right across from Fort Christmas Park. The address is 1300 North Fort Christmas Road, Christmas, FL 32709. • Please leave your pets at home; there are wild animals. • Food will be available for purchase. • Free admission and free door prizes! • For more information: call Orlando Wetlands Park 407-568-1706, or visit the event website: http://www.cityoforlando.net/wetlands/. • We are also on Facebook at: https://www.facebook.com/OrlandoWetlands.